This book looks at what motivates us to take photographs and at some of the methods of using the camera to do so successfully. It also examines some standards that should be applied to the photographs that we take of buildings to ensure that they will be useful documents in the record of the historic environment. Writing about photography tends to verge towards the technical, but the intention with this book is to ‘keep it simple’. Light is what we work with, whether we make use of existing light sources or introduce our own; it is this which will most greatly influence our photographs and our understanding of what we have captured through the lens. Digital capture is a great liberator for the photographer, but this can lead to a scatter gun approach. This book brings a more thorough and measured approach to the process. Other factors such as viewpoint and technical settings on the camera will also play a vital part in the story we want to tell. Illustrated throughout with examples of good and bad practice, this book sets out techniques and strategies in a simple and straightforward way for those who want to make their photographs of buildings truly effective. Steve Cole was Head of Photography at English Heritage. He retired in March 2014, having worked for over forty years as a photographer in the cultural heritage sector. Cole's tips are worth keeping in mind to help achieve beautiful, informative, and accurate results with a digital camera. ... this is an exceptionally good book. Steve Cole, former head of photography at English Heritage, provides a wealth of advice that would benefit any photographer, from beginner to professional. Each of the book's many photographs has a caption that explains an important point. Particularly useful and well-illustrated sections explain how to photograph specific subjects (staircases, for example) and how to carry out a photographic survey. If you want inspiration as to how to record buildings, monuments and archaeological detail in buildings, this book is essential reading. However, the book is much more than that. The detailed technical advice, especially on the digital world of imaging, is pretty much essential for anyone who, like me, has not got a clue how digital images are created. If you follow the advice, you will become a better photographer. ... 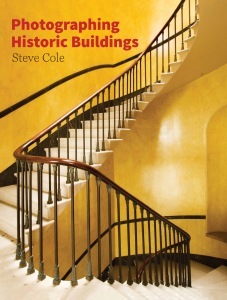 Overall, this wonderful book of huge practical value to anyone remotely interested or engaged in buildings enough to want to take photographs of them ... It is also a lovely book just to browse and enjoy on its own merits, and for the price it is a real bargain to boot.